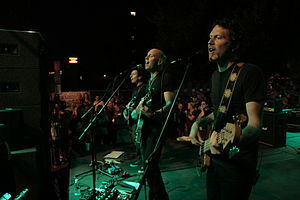 Vertical Horizon performing at the Hartford Block Party in 2010. Vertical Horizon is an American alternative rock band formed at Georgetown University in Washington, D.C. in 1990. The band is best known for their 1999 hit single, "Everything You Want". Their most recent album, The Lost Mile, was released on February 23, 2018. Vertical Horizon was formed in 1991 by Georgetown University undergrads Matthew Scannell and Keith Kane. Early performances included cover sets of artists such as Simon & Garfunkel in the campus' Leavey Center food court. In 1992, after graduation from Georgetown, the duo relocated to Boston and self-released their debut album There and Back Again, which was recorded in Scannell's old high school, Deerfield Academy, over a period of a few weeks. Scannell and Kane split songwriting and lead vocal duties. Scannell and Kane toured as a duo for the next few years, mostly appearing with similar bands, such as Jackopierce. Their next album was 1995's Running on Ice, produced by John Alagia (Dave Matthews Band, John Mayer), Doug Derryberry, and Scannell. Though still largely acoustic based, Running on Ice also incorporated other musicians and guests, including Derryberry, Jackopierce, and Carter Beauford of the Dave Matthews Band on drums, giving the album more of a full band sound. Two songs, Kane's "Wash Away" and Scannell's "The Man Who Would Be Santa", were featured on the second Aware Records compilation album. More touring followed through 1996 as Vertical Horizon was joined by drummer Ed Toth. Live Stages was released in early 1997, and featured four new songs and more of an emphasis on electric guitar. By this time, the band was explicit in their intent to find a major record label; band members have said that it was no accident that the first track of Live Stages opens with the sounds of a large cheering audience. Eventually, the band was signed to Sony BMG Music Entertainment/RCA Records. In early 1998 the band held auditions for a permanent bassist. Sean Hurley, a student at the Berklee College of Music, impressed all and was officially invited to join Vertical Horizon. Vertical Horizon's indie albums began to attract record executives from several record labels during the late 1990s. The band signed with RCA Records in 1998. RCA re-released Vertical Horizon's independent albums, with new packaging and graphics. Before the RCA re-release, the band's first three albums had sold 70,000 combined units. The band's first effort with RCA Records was 1999's Everything You Want, with producers Ben Grosse, Mark Endert, and David Bendeth (Paramore, Your Vegas). The first single, "We Are", was mildly successful on Modern Rock stations. The second single, "Everything You Want", proved a breakout as the single skyrocketed to the top of the charts and became the 5th most played song on the radio in 2000. A third single, "You're a God", also did very well and was released as a live performance on the charity album Live in the X Lounge III. It was also featured in the movie Bruce Almighty. The fourth single, "Best I Ever Had (Grey Sky Morning)", received moderate airplay. In 2005, a remake of the song would become a top 10 country hit for Gary Allan. The band, which had been touring constantly since the album was released, continued touring until well into 2001. After taking a break, the band came back to the studio to record their follow-up, which they hoped would be released soon enough to take advantage of the huge popularity of Everything You Want. Since 2001, the album is certified double Platinum by the RIAA, having sold 2,000,000 copies in the US. After some delays, it was announced that the new album, Go, would be released in September 2002. Go was released while RCA was going through a major restructuring and as a result, the album received little support from the label. The album's first single, "I'm Still Here", did moderately well, but when it failed to match the popularity of "Everything You Want", RCA did little to promote the album and as such, no videos were produced and the label didn't back the album's supporting tour. Scannell was upset that RCA didn't support the album, saying "Without the label behind us, it just floundered and sort of withered on the vine, which is just a heartbreaker." Eventually the band went on a short tour in early 2003, and it was announced that Go (produced by John Shanks) would finally be released a year late, in September 2003. A larger tour started in August, leading up to the release of the album. In the middle of 2004, the band ended their relationship with RCA. A new deal with Hybrid Recordings was inked in early 2005, with plans to re-release Go in the summer, including an additional song, "Better When You're Not There", which was not present on the original RCA release. The song "Forever" was sent to radio ahead of the release for promotion. In 2005, longtime drummer Ed Toth left the band to join The Doobie Brothers. Since then various drummers began playing with Vertical Horizon including Blair Sinta, Ron LaVella, Craig McIntyre, and Jason Sutter. Matt Scannell performing at Borders in support of 2009's Burning the Days. Burning the Days was released on September 22, 2009, and is the group's first release after a five-year hiatus. Singer/songwriter Matt Scannell has said that Burning the Days marks a shift in his songwriting, both musically and lyrically. According to Scannell, "There is a lot more variety and quite a few different artistic moods on this record - almost different sonic landscapes... a lot of these songs feel like a faster tempo than anything we’ve ever done before." Neil Peart of the Canadian rock band Rush plays drums on three songs on the album, "Save Me From Myself", "Welcome to the Bottom", and "Even Now". "Even Now" is a co-write between Matt Scannell and Neil Peart, with Peart writing the lyrics and Scannell writing the music. Scannell asked Peart if he would be interested in playing drums on the song, and Peart responded, "No one else can play drums on it — I won’t let anyone else play drums on it. I have to play the drums on it." On June 23, 2008, during a Duo concert in Lincolnshire, Illinois, Scannell debuted a new song called "Save Me From Myself" off the upcoming album. Also, on June 26, 2008, in Downers Grove, Illinois, Vertical Horizon debuted another new song called "All is Said and Done" off the upcoming album. The song was added to the playlist on the band's Myspace page on October 20, 2008. On June 2, 2010, Matt Scannell announced via Facebook that "Keith is not touring with Vertical Horizon. We've been friends for a long time so please join me in supporting his solo and Boys Gone Wild performances." 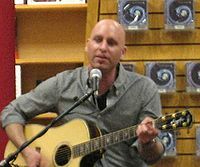 On June 3, 2010, Kane confirmed his departure from the band, saying he would not be touring with Vertical Horizon "as I shift my focus to my solo career. I am thrilled to currently be writing my first solo album as well as working on collaborations with Brian Fechino and Chardy McEwan, and with my friends from Stroke 9 in our band 'Boys Gone Wild'." Guitarist Steve Fekete has taken over the backing vocals/rhythm guitar role in the band, but all three slots in the band besides Scannell have rotated to some degree. In late June 2010, "The Lucky One" was released to radio as a single. Vertical Horizon announced in June 2011 that they had begun recording new material for a new album. The album, Echoes from the Underground, was released on October 8, 2013. Peart returned as a guest artist on drums for the tracks "Instamatic" and "South for the Winter". In June 2017, Scannell announced at a concert in Fairfax, VA, that a new album was forthcoming summer 2017. Their seventh album, The Lost Mile, was released on February 23, 2018. In September 2018, Vertical Horizon is scheduled to appear at Epcot at Walt Disney World as part of the Eat to the Beat concert series during the annual food and wine festival. ^ "The Lost Mile is available everywhere digitally, NOW!". Retrieved February 23, 2018. ^ a b c d e f g "Artist Profiles: Vertical Horizon". Billboard Magazine (page 98). May 21, 2001. Retrieved July 17, 2011. ^ "Gold and Platinum Database Search". Retrieved June 18, 2009. ^ Carpenter, Troy. "New Album a 'Go' For Vertical Horizon". billboard.com. June 30, 2003. ^ Chad. "Vertical Horizon And Pat McGee to Re-Release". Alternative Addiction. May 5, 2005. ^ a b Chad. "Vertical Horizon Reveals Tracklisting". Alternative Addiction. July 11, 2009. ^ a b Chad. "Vertical Horizon Ready August Release". Alternative Addiction. July 6, 2009. ^ Peart, Neil. "News, Weather, and Sports". NEP.com. June 17, 2006. ^ a b Mover, Jonathan. "Matt Scannell on Neil Peart Artist P.O.V.". Drumhead Magazine. date unknown. ^ "Keith Kane Leaves Vertical Horizon". Alternative Addiction. June 9, 2010. Retrieved July 17, 2011. ^ "Vertical Horizon Working On New Album". Alternative Addiction. June 21, 2011. Retrieved July 17, 2011. 1991 establishments in Washington, D.C. This page was last edited on 2 April 2019, at 05:04 (UTC).